There's a new object in the yellow circle where the one in the red circle previously was. Note: I've send an email request to JPL on Monday May 28 2012, also to ask how far apart these images were taken, so far no reply yet. After initially making good progress on a new route around "Home Plate" to the east, Spirit has been struggling in local terrain on the northeast corner of Home Plate. The route is difficult because the direction is up-slope with a lot of loose, fine material denying the five-driving-wheel rover good traction. After getting about 15 meters (49 feet) away from Home Plate last week in just two drives, Spirit made only 1.4 meters of progress on Sol 1831 (Feb. 26, 2009). The next two drive sols accomplished only about 2 meters each. On Sol 1837 (March 4, 2009), Spirit had difficulty turning to face a new direction, again because of the soft terrain. The plan is to back downslope a little, turn and attack the uphill grade a little more cross-slope. As of Sol 1837 (March 4, 2009), Spirit's solar array energy production is 282 watt-hours, atmospheric opacity (tau) is 0.742, and the dust factor on the solar array is 0.320. The rover is in good health as it attempts to make its way around the northeast corner of Home Plate. Spirit's total odometry is 7,602.42 meters (4.72 miles). 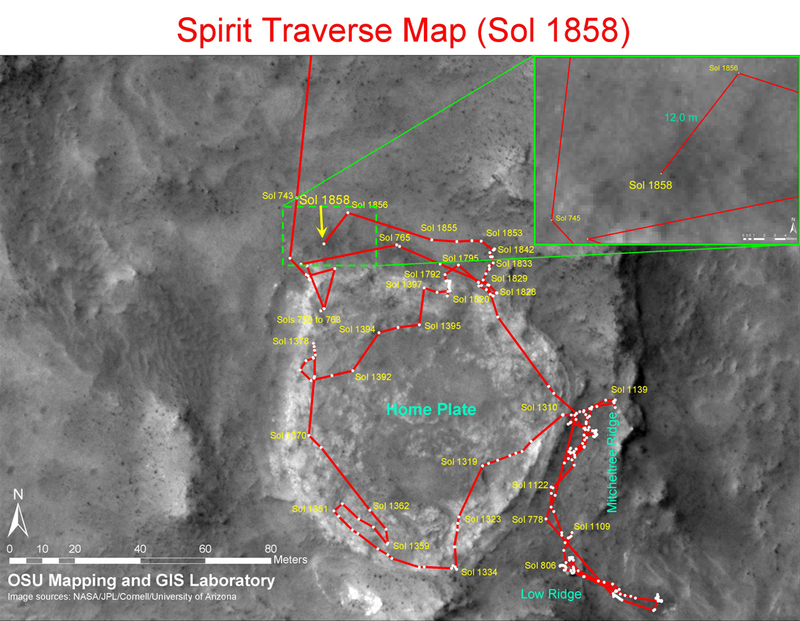 Spirit continued to struggle in local terrain on the northeast corner of "Home Plate." Several drive attempts failed to make significant progress to the east up the modest slopes consisting of loose material. On Sol 1839 (March 6, 2009) a wheel diagnostic test was performed to make sure a wheel stall seen on an earlier sol was not an actuator problem. The actuator is fine. Drives on sols 1839, 1841 and 1843 (March 6, 8 and 10, 2009) all reinforced the futility of attempting further drives in this direction. 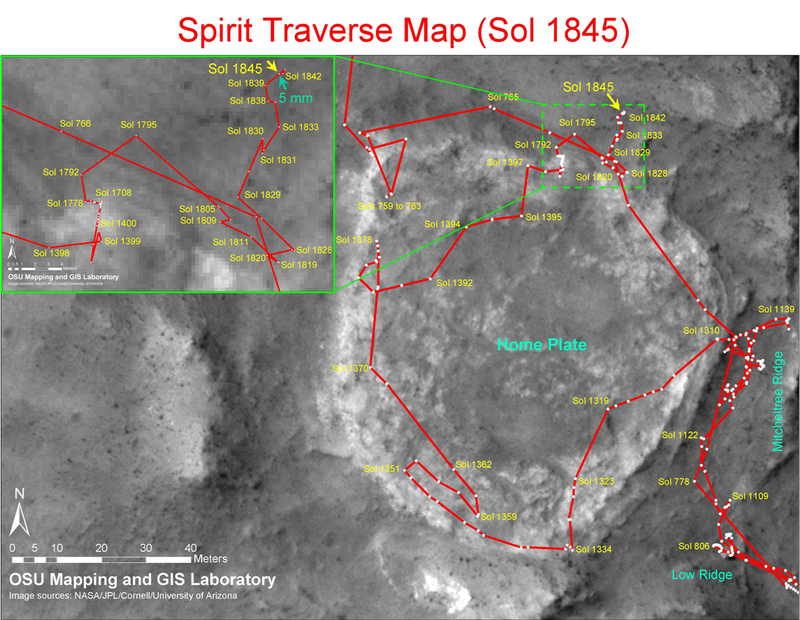 Therefore, the project decided to head Spirit in the other direction, west around Home Plate. Spirit will begin to head that way in the sols ahead. As of Sol 1844 (March 11, 2009), Spirit's solar array energy production is 281 watt-hours. Atmospheric opacity (tau) is 0.755. The dust factor on the solar array is 0.317, meaning that 31.7 percent of sunlight hitting the solar array penetrates the layer of accumulated dust on the array. The rover is in good health as it begins to head west around Home Plate. As of Sol 1843 (March 10, 2009), Spirit's total odometry is 7,607.68 meters (4.73 miles). 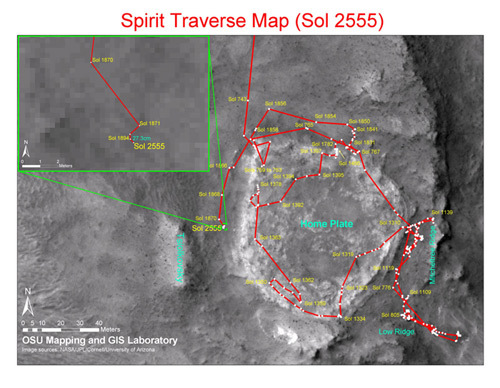 Although Spirit will now attempt the western route around the low plateau "Home Plate," it must first safely move away from difficult terrain around the northeast corner of Home Plate. One tactical concern was a potato-size rock near the inside of the right rear wheel that posed a risk of getting stuck inside the wheel. Short maneuvers on Sol 1845 (March 12, 2009) and Sol 1847 (March 14, 2009) carefully moved the rover away from this hazard. On Sol 1850 (March 17, 2009), Spirit moved about 5 meters (16 feet), getting completely away from this trouble spot. Spirit also conducted some panoramic camera (Pancam) imaging and miniature thermal emission spectrometer (Mini-TES) spectral measurements of various science targets in the vicinity and performed an atmospheric argon measurement with the alpha particle X-ray spectrometer (APXS). Atmospheric conditions have worsened lately over the Gusev site, although no storm conditions have been reported. As of Sol 1851 (March 18, 2009), Spirit's solar array energy production has decreased to 230 watt-hours, down 18 percent from a week earlier. Atmospheric opacity (tau) has increased sharply, to 1.19. The dust factor on the solar array is 0.313, meaning that 31.7 percent of sunlight hitting the solar array penetrates the layer of accumulated dust on the array. The rover is in good health in spite of dustier skies. As of Sol 1850 (March 17, 2009), Spirit's total odometry is 7,612.49 meters (4.73 miles). Spirit is making good progress around Home Plate to the west. After getting clear of troublesome rocks, Spirit drove 13.8 meters (45.3 feet) on Sol 1854 (March 21, 2009). The next drive, on Sol 1856 (March 23, 2009), achieved a new distance record for five-wheel driving. Spirit drove 25.82 meters (84.7 feet), beating the old record by about a meter. Spirit completed another drive of 12.9 meters (42.3 feet) on Sol 1858 (March 25, 2009). As of Sol 1858 (March 25, 2009), Spirit's solar array energy production is 233 watt-hours. Atmospheric opacity (tau) remains elevated at 1.15. The dust factor on the solar array, 0.309, means that 30.9 percent of sunlight hitting the solar array penetrates the layer of accumulated dust on the array. The rover is in good health in spite of dusty skies. 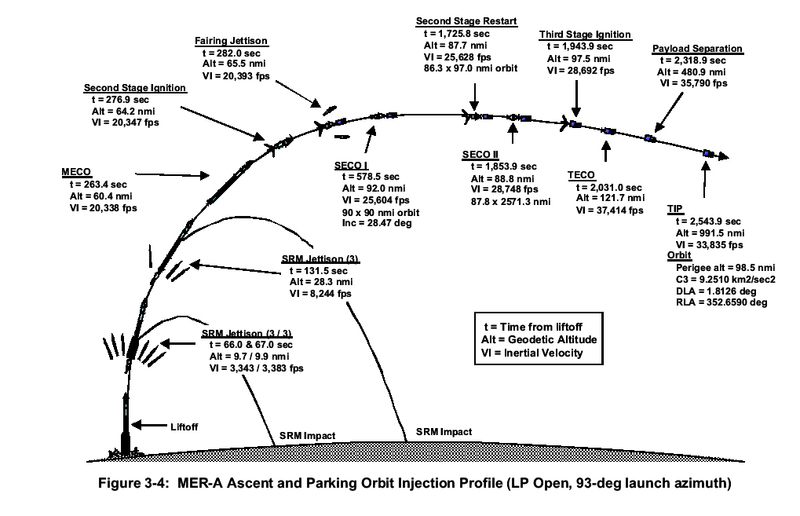 Spirit's total odometry is 7,665.02 meters (4.76 miles).